A little birdie woke me this morning at 4:45 with a very pretty, but LOUD, call right outside my open bedroom window. I tried to go back to sleep but no such luck. Gave up and got up. rrrrgh. Life has been somewhat hectic this last month. My son-in-law has been in Fiji leading an archaeology field school so my daughter and grandson have been staying with us. Having a 3 1/2 year old around makes for very different days - his energy is unstoppable so there is something happening all the time. He is so cute, so lovable, so affectionate and sooooo busy! I love having them here -- J loves to cook so we have great meals cooked for us as well as lots of home baking (not good for the waistline but so what!) 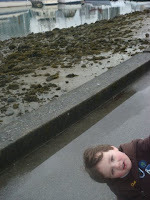 The little guy had strep throat last week, fever, lethargy, swollen tonsils, etc. Poor baby, he really felt miserable, but he was such a trooper saying "I feel better now" whenever we fussed over him. He had to go on antibiotics and yesterday we noticed a rash over most of his body. We stopped the antibiotics (he has had a full week's worth), gave him a soothing bath and hopefully it will be better when he gets up this morning. I have been getting quite a bit of knitting done as it is something I can pick up and fire off a few rows in between gramma, mom and wife chores. 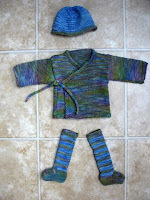 The Sea Baby outfit is for the new grandson due in September. It was a lovely knit with yarn that was 30% Sea Cell. Such a cute pattern. I also made a tea cozy for J to match her lovely Denby ware. That was done in Cascade 220 wool which felts beautifully. Felting always scares me - taking a nice, albeit large, object and tossing it into a hot water wash and agitating the hell out of it is somewhat of a leap. I have only had to frog one item (slippers) but that wasn't the felting process, more the pattern being weird and the slippers ending up looking like a plaster foot cast. I save them though as you can cut the felted object like fabric so may be able to use them in or on something else one day.